This Halloween, why not try one of these three pumpkin pie recipes? Halloween is all about the pumpkins, and with Thanksgiving coming up in November, you can start your baking early and perfect some of these recipes. Halloween desserts are fun because you can make them look like spooky creatures. Halloween food ideas often revolve around the season of fall which means there are plenty of cinnamon, nutmeg, and other fall-inspired spices to keep you feeling cozy. 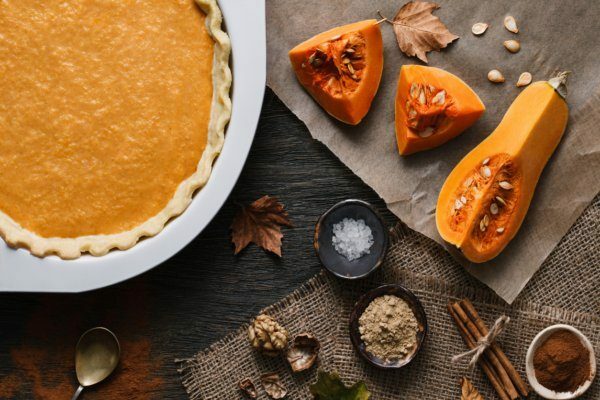 So, if you’re looking for Halloween recipes or Halloween party food ideas, look no further than these delicious pumpkin pie recipes that are sure to be a hit all season long. Nothing says fall or Halloween like the smell of fresh pumpkin pie. If you’ve never made pumpkin pie before, these recipes can easily get you started. Beat the cream cheese, confectioners’ sugar, and vanilla extract until nice and smooth. Spread your mixture into the pastry shell. Whisk together the whipping cream, canned pumpkin, sugar, and pumpkin spice together and pour your second mixture over the first one in the pie crust. Cover the edges loosely with foil. Bake the pie at 350 degrees for 70 to 80 minutes, or until an inserted knife comes out clean. Cool your freshly baked pie on a cooling rack and store in the refrigerator. This will serve six to eight party guests, depending on how big they like their slices. Combine sugar, cornstarch, salt, and cinnamon in a small bowl and combine the eggs and the pumpkin with your sugar mixture in a large bowl. Gently stir in the milk. Once the milk is all poured in and the mixture is well mixed, pour into the pastry shell. Bake your pie at 400 degrees for 10 minutes then reduce heat to 350 degrees and continue baking for 45 to 50 minutes or until the knife comes out clean. When serving, feel free to top with the canned whipping cream if desired, or opt for vanilla ice cream. Preheat your oven to 350 degrees, unroll the pastry dough, and transfer it to a nine-inch pastry dish. In a large bowl, whisk eggs, pumpkin, cream, sugar, cinnamon, salt, allspice, nutmeg, and cloves—pour your mixture into the pastry dish on the pie dough and bake your pie for 40 minutes. While baking, it’s time to make the ginger-streusel. Combine flour, brown sugar and crumbled butter and stir in walnuts and ginger. Sprinkle this mix on top of your pie. Bake for an additional 15 to 20 minutes or until a knife comes out clean. Cool your pie on a cooling rack and serve. Pumpkin pie recipes come in all varieties; how will you choose what to make this Halloween? We have an idea—make all three! Who doesn’t love options when it comes to pie. Better yet, keep these handy recipes with you and replicate them for Thanksgiving. “Pumpkin cream cheese pie recipe,” Taste of home web site, http://www.tasteofhome.com/recipes/pumpkin-cream-cheese-pie, last accessed October 25, 2016. “Cinnamon pumpkin pie recipe,” Taste of home web site, http://www.tasteofhome.com/recipes/cinnamon-pumpkin-pie, last accessed October 25, 2016.